My daughter is in love with her glow in the dark pet fish sensory bottle. It is her bedtime buddy and her daytime friend. My husband and I thought a glow in the dark pet fish would help soothe her at bedtime… It has been super helpful! During the day, I can sneak off for quite a while every time she starts chatting with these beauties! Did I tell you how much I love these little fish? I think I might love them more than my daughter does! To see another glow in the dark bottle check out this glowing loom band bottle. For more information about sensory bottles and their uses check out Calm Down Sensory Bottles 101. This post contains affiliate links for your convenience. I earn a small commission at no cost to you. Thank you for choosing to support this blog! These fish glow in the dark fish don’t glow brightly or last long. They can be ‘charged’ by placing them under a regular light or in the sun, but the glow still won’t last long. To make these fish really glow a black light works best. We tested several types of containers and they were all great! They are pictured above and below. 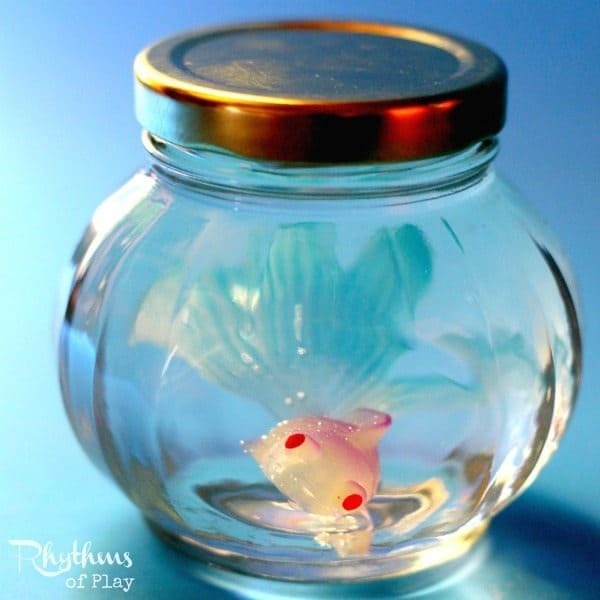 Choose the type of jar that you like best! Container with lid. We used jars that looked like fish bowls, short wide mouthed canning jars, and jars with locking lids. Normally I write tutorials that are pretty detailed. This one is so short I feel silly for even writing it! Place fish inside. (These fish do not float. They sit on the side or bottom of the container. 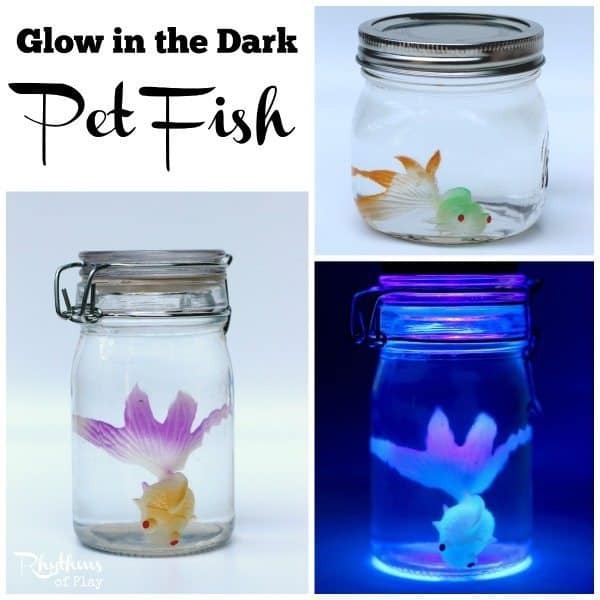 I choose not to glue these glow in the dark pet fish. They can get tossed around during play and I’d rather reach in there and place the fish upright than try to shake it back into place. Since there is nothing but water and a fish in this sensory bottle, I’m not as worried about not using glue as I would be with a glitter sensory bottle! To learn more about sensory bottles, their uses, how to make them, and troubleshooting tips check out Calm Down Sensory Bottles 101. Make a glow in the dark pet fish sensory bottle for kids. It’s perfect for soothing kids at bedtime, great for pretend play, and makes an easy gift idea! For another glow in the dark bottle check out this glowing loom band bottle! For more fun ideas follow me on Pinterest! Visit Nell @ Rhythms of Play’s profile on Pinterest. Subscribe to our mailing list so you don’t miss the next post!